Showing 1 to 7 of 45 posts. The Spanish publisher Ludonova has announced Reiner Knizia's Babylonia. Not alot is known so far, but we do know it's a tile laying game, in which "chaining" the tiles is an important mechanic, since scoring relies on these long chains, the score which is awarded continuously. 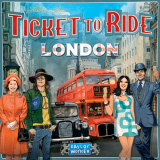 Days of Wonder has announced Ticket to Ride: London, which is a scaled down version of the original, much like Ticket to Ride: New York, but set in 1970s London. The game supports 2-4 players, and will take about 10-15 minutes to play. Splotter games are as developing an Food Chain Magnate expansion as we speak, called The Ketchup Mechanism & Other Ideas. The expansion will be avaible some time during 2019 and is avaible on pre-order from Splotters website. Splotter claim "the expansion is in good shape", but it is till being tested and balanced out. Vital Lacerdas map from Age of Steam is now coming to Railways of the World! The project will be launched as a kickstarter project, starting at January the 3rd. Railways of Portugal expands the Railways of the World series with a new map of Portugal designed by Vital Lacerda (The Gallerist, Lisboa, etc.). You plan and lay track, upgrade your trains, sell goods to other cities, and use operation cards to become the richest in Portugal! Balance your budget wisely, since taking too many bank bonds can ruin your business over the course of the game. Foreseeing your competitors moves and making well thought out moves for yourself will ensure you an undisputed railroad empire!